One thing I love about purchasing items from overstock is that it is ALWAYS good quality. The second thing is that it ALWAYS ships so quickly! Thank you Overstock, this item was no different! I appreciate this site so much! Bring the open charm and adventure of the outdoors in with this natural Scots Pine wood cat tree. 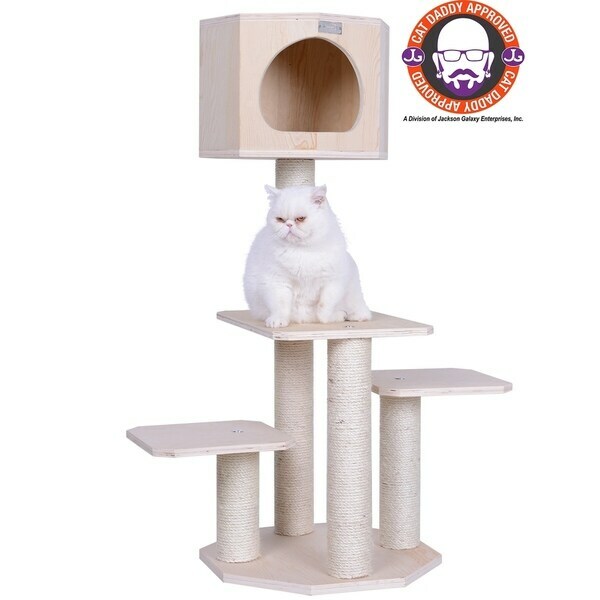 Featuring 3 tiered platforms for perching and playing, this tree is topped with a cozy cat condo that your feline family members are sure to love. Five scratching posts and the fresh fragrance of natural Scots Pine wood make this piece a fun and fresh cat playground for years to come. Dimensions 28.0 In. X 26.0 In. X 46.0 In. My cat has already slept in the house, and since we just moved, I have been putting her cat food bowl on the top perch to keep the dogs from getting it. This is sturdy and easy to keep clean. I don't like the carpeted cat perches, because they are a pain to keep fur free, so this will stay clean and it looks good too. I love these wooden cat trees! I have several and the cats love them! "hi what are the measurements of the (3) platforms? Thanks"